So where did Duke end up? Practically around the corner, some four blocks away on another Lamar billboard that happens to be right outside the front door of a house on a street lined with houses and apartments. And that house happens to be a mile from a neighborhood park where two high school students were shot and killed just two days after Councilman Rosendahl’s office contacted Lamar about the Duke Nukem ad. Coincidence? Of course. And those involved in producing and marketing the video game will be quick to argue that there is no relationship between violent entertainment and real-life violence, and they’ll call attention to last week’s U.S. Supreme Court decision striking down a California law banning the sale of violent video games to minors without parental consent. In that decision, Justice Antonin Scalia cited such fairy tales as Cinderella and Snow White as examples of depictions of violence in children’s literature. “Certainly the books we give children to read – or read to them when they are younger – contain no shortage of gore,” Scalia said in the majority opinion. 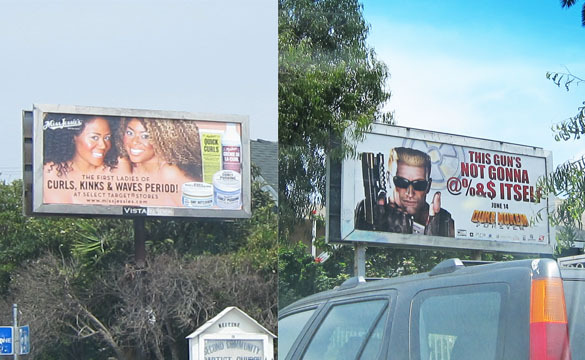 The producer’s description of the “Duke Nukem Forever” video game is quoted in its entirely in our previous article, but suffice to say it involves such activities as decapitation, dismemberment, impalement, and bodies exploding and “bursting into bloody gibs.” It also allows players to kidnap “babes” and slap them if they resist. Regardless of where one stands on the question of whether government should regulate children’s access to such fare, it’s hard to imagine what playing that game would have in common with reading Cinderella and other classic children’s tales.